Perfect family vacation place in Minnesota! Clean, comfortable and modern Northwoods “Cabin 12” at Loon’s Nest Resort in Park Rapids is the perfect place to spend your Minnesota family vacation. Your family will enjoy this large two-bedroom with a beautiful lake view. This housekeeping cabin provides a fully-equipped kitchen with fridge, microwave, cooking utensils, coffee maker and toaster. Along with cable TV, the cabin includes a breakfast bar, one queen-size bed, two double beds. 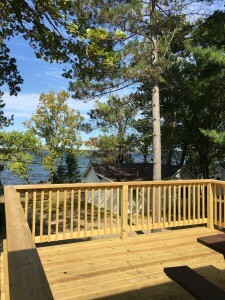 Has a new deck facing the lake. The bathroom includes both a tub and shower. You’ll wake up to a beautiful sunrise overlooking Fish Hook Lake with loons calling right outside your front door. This Minnesota cabin offers charming decor, with finished natural knotty pine throughout for a warm, homey feel. When the sun shines through the large sliding glass door it brightens up the entire cabin. Rates based on 6, sleeps 6 max.